But bringing science to the ignorant is hard to do well. And unfortunately, given the tenor and quality of the writing here, it’s not clear which new readers can be expected to wake from their slumber. Ten chapters cover subjects ranging from the Big Bang, and the basics of chemistry and biology, to general evolution, hominid evolution, and the neuroscience of the human brain. A final chapter, How Will Everything End? looks at scientific theories and speculations about a rattle-bag of threats, including nuclear war, global warming, and the heat death of the universe. Every page is packed with facts, and there are useful boxes, set off from the main narrative, on subjects ranging from the Cambrian Explosion to why you’re wasting your money on probiotics. Fitting less comfortably into the alpha-to-omega “what we now know” scheme is a chapter on race—or why genetics shows human “races” to be social constructs with no objective basis in biology. Since this is the science of why some regrettably common beliefs have no basis in science, it raises a question: If there’s a chapter on racial pseudo-science, why not ones on astrology, alien abduction, and animism? And why not, instead, stick to the format and include a chapter on geomorphology, relativity, or quantum mechanics? But this is a quibble. A more important question is how many people who were staring out of the window in high school, and aren’t motivated to read the dozen most relevant Wikipedia articles, will read these pages? With popular science, the answer is always the same: a lot of people will, with luck, if the style is enticing, fun, concise, novel, and memorable. But At Least Know This wraps its raw facts in prose that’s didactic, earnest, and—given the simple nature of the material—far too much work to read. The style is characterized by long “Professor X says” quotation-dumps that only belabor the obvious, filler sentences that add nothing, beat-you-over-the-head repetitions—and plain muddles. We learn for instance that “The Earth is old. Very old. It formed about 4.54 billion years ago. . . .” Fair enough. But that number, or a version of it, is repeated seven or eight times over the ensuing four pages, in a passage that reads like a word processor with a stuck key. In the chapter on race we are told that “The common race categories don’t work because the human species has never cooperated with anyone’s desire for neat and consistent biologically based categories that can contain hundreds of millions of people with some respectable degree of coherence and consistency.” The heart is in the right place, but everything after that “because” is nonsense. Ask anyone who suffers from a common genetic condition like sickle-cell anemia, or maleness. 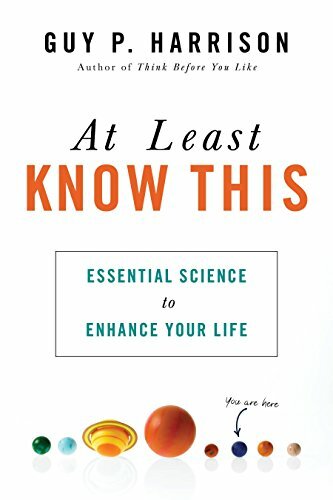 In the introduction, we are admonished (there’s a lot of admonishing) that it’s important to base our judgments on evidence, because “evidence-based knowledge impacts if not determines the success of our actions.” In one way, this is too obviously true to need stating: some actions go badly when based on bad evidence. But in the sense Harrison intends, it seems to be false: much of the scientific knowledge presented in the book, however fascinating, is either tenuously related or unrelated to any of our likely actions. The ill-considered moral—better get a grip on this stuff, or there will be consequences—pops up again and again. “Knowing something about . . . the brain . . . is a fundamental key to improving individual lives and entire societies.” A painful irony lurks here: this kind of vague, science-is-good-for-you boosterism is itself unsupported by any evidence, or certainly by any offered here. Yes, the universe is wonderful. But the best science writing finds precise, terse, memorable language in which to reveal its wonders, then allows them to speak for themselves. The uninformed are never going to be won over by having a finger wagged at them about their failure to be adequately amazed, especially by a writer who’s in too much of a hurry to be clear. Richard Farr Ph.D. taught philosophy at Colgate and the University of Hawaii. As a journalist he has reviewed popular science, biography, history, literature, philosophy, politics, travel, and both adult and children's fiction. He is the author of Emperors of the Ice, The Babel Trilogy, and other books.